Today is the day! Are you ready for 55 cent WHOPPER sandwiches? Who doesn't want a deal over the holiday spending season. 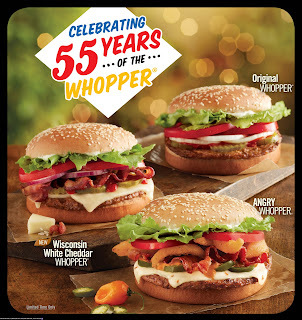 To celebrate the WHOPPER Sandwich being 55 years old, Burger is offering a great day. Burger King's classic sandwich has become an American icon and for a limited time. Burger King will be offering 55 cent WHOPPERS to its guests. 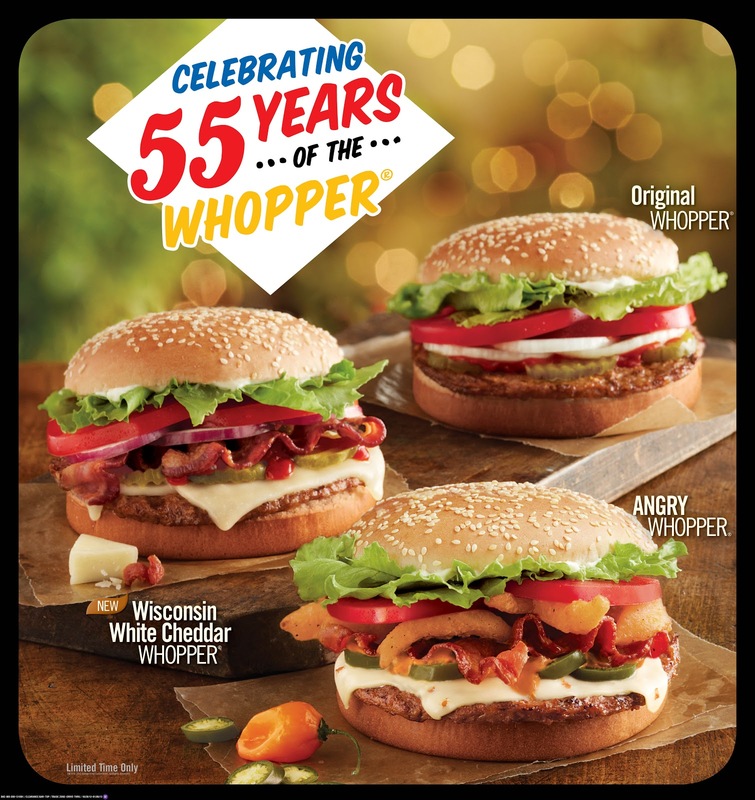 From December 6 through December 9, Burger King guests can receive an original WHOPPER sandwich for 55 cents when they purchase an additional WHOPPER sandwich. Patrons can choose from the original sandwich or a new variety. Burger King has introduced two new versions of the WHOPPER to its customers. These sandwiches are the Wisconsin White Cheddar WHOPPER Sandwich and the Angry WHOPPER sandwich. The Wisconsin White Cheddar WHOPPER Sandwich is USDA-certified ground beef, topped with thick-cut hardwood smoked bacon, natural Wisconsin white cheddar cheese, juicy tomatoes, freshly cut lettuce, crunchy pickle slices, sliced red onions, all on a toasted sesame seed bun. The Angry WHOPPER sandwich is prepared with fire-grilled, USDA-certified ground beef, thick-cut hardwood smoked bacon, melted Habanero cheese, jalapeño slices, spicy onion petals, red ripe tomatoes, crisp lettuce and angry sauce, all served on a toasted sesame seed bun. Both versions are available in junior sizes for approximately $2.19 or regular size for $4.49. These special sandwiches will be available for a limited time. Celebrate an American classic this week at Burger King. It's time to roll back prices and indulge in the iconic WHOPPER today.